A 198 square ft. tiny house on a lavender/aquaponics farm in Oregon's wine country. The Tiny House is well supplied for your comfort and convenience. For sleeping, you can choose between the extra comfy futon or, for the nimble and adventurous, the loft. The Tiny House also has simple and effective climate control to keep you comfortable throughout the year. If you prefer, you might want to keep the windows open and enjoy fresh air and the sounds of owls, coyotes, red tails and other wildlife from the nearby forest. The kitchen is complete for making simple meals (we're happy to supplement from our vegetable garden in season), or if you prefer to eat out we are a short drive from a great selection of restaurants and cafes. Wineries are very close too. On the property you can enjoy great views of the coast range, acres of land to stroll and hike, alpacas, goats, chickens and the friendliest dogs to greet you. There is also a lavender gift store open on requests for guests. My family and I enjoy hosting and meeting travelers. We have three young adult kids and many friendly animals on our farm. I enjoy aquaponics, distilling essential oils, playing soccer and squash, outdoor adventures and having interesting discussions with interesting people. We did not intend to live on acreage, but now would not have it any other way. We love the space, lifestyle and ability to grow organic produce, fruits and herbs on our property. We also like having animals such as alpacas, goats, chickens and more. You will have the Tiny House all to yourself. We are close by in case you need anything, but far away enough so you can have privacy. The Tiny House has a nice deck where you'll be tempted to have a glass of wine at sunset while looking and listening for wildlife. While the Tiny House is well stocked, it is not cluttered or packed with things you would not need for a short term stay. Large items like a washer/dryer, built-in oven, large closets are absent in favor of space and practicality. We truly hope you will enjoy your stay. Tiny bathroom includes small shower that uses a small hot water tank. No long showers please. A small refrigerator is included. A portable convection oven is available upon request. A small kitchen with hotplate, microwave, sink, utensils and more is included. 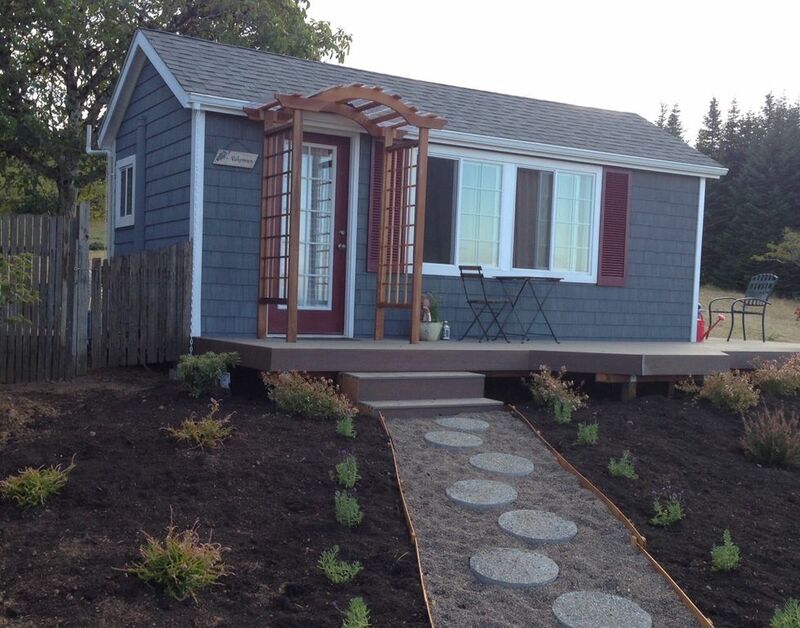 The tiny house is too small for wheelchairs or people with mobility limitations. Very large guests will have a very difficult time in this small space. Inviting, relaxing, will visit again! Very hospitable, animals were very fun to interact with. Cozy tiny house, we were able to relax and unwind. My wife and I visited for an extended weekend and to be honest we were a little anxious to be staying in a tiny house. I am thrilled that we did. The tiny house was very clean and comfortable. The property was beautiful and in a wonderful location to visit local wineries. In addition, the property host was extremely nice and helpful, with him making several excellent recommendations on what to visit around Oregon. It was an enjoyable vacation all around. We had a great time staying here while touring the area and visiting family! We thoroughly enjoyed our time at the Tiny House. It fit all our needs for our weekend getaway to do wine tasting. Very close to some great vineyards. The farm was quaint and the hosts were very friendly. Their suggestion for breakfast down the road was tremendously good. We would definitely stay there again in the future. The owners are extremely friendly and are very caring people. The house was clean and ready for us upon arrival. This is perfect place for extended weekend or visiting family and friends in the area. Good location to and from the different sections of Portland. Loved the country atmosphere. Loved the our introduction to tiny houses. We will the tiny house again.